A woman who lay trapped beside her dead husband after a drink-driver hit their car has relived her horror. Newly-weds Julie and Colin Taylor were on their way to see their granddaughter when Russell McKeever ploughed into their car after an afternoon of drinking. The 42-year-old businessman was more than three times the drink-drive limit when he was tested at hospital four hours after the crash. He has admitted causing Mr Taylor’s death by driving dangerously on the A933 Brechin-Arbroath road on October 31 last year. Today Mrs Taylor – who married her love of 30 years just three weeks before the crash – described the moment McKeeveer’s Audi A3 smashed into them and described it as like being hit by “a bomb”. “And then I saw him and shouted on him. I knew he was dead. “At one point I screamed at him, ‘don’t leave me, please’”. And she accused McKeever, of Dundee, of destroying her life that day insisting he had a choice when got in the car and drove after drinks with friends. 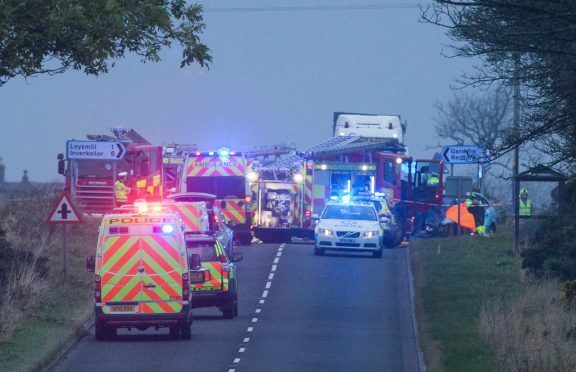 As he drove along the A933, near Leysmill junction, he crossed onto the wrong side of the wrong and hit the Taylor’s Citreon Picasso, which was heading towards Arbroath. Mrs Taylor was trapped in the car for half an hour, and underwent 12 hours of surgery to treat her serious injuries. More than a year on, she still takes painkillers and suffers flashbacks. “My life is never going to be the same again, never ever, and neither is my family’s,” she said. McKeever admitted the offence at the High Court in Aberdeen yesterday, and will be sentenced next month. The court heard when he was tested – at 7.15pm, four hours after the crash – he gave an alcohol reading of 226 milligrams of alcohol in 100 millilitres of blood. The legal limit at the time was 80 milligrams. And Mrs Taylor today called for attitudes around driving offences to change..
“If someone comes up and hits you, stabs you or assaults physically, some of them will get longer sentences than a person who has caused a crash that’s killed someone. “Until these sentences are made to fit the crime, people will not learn. They will just carry on driving the way they do.